Thanks for your comment Dave. It's appreciated. Removing the sun (from the event's picture) whitout disturbing the orbits of the planets is only a fictional way for indicating that the planets are subjected exclusively to their proper speed in regard to their orbit; because the gravity relation of the planets is strictly with the altered geometry of the surrounding space. There is no direct effect of the sun on the planets like indicated by Newton's concept of "attracting masses". It doesn't mean that if you "really" remove the sun from the system, there won't be any changes in the altered geometry of space, meaning its metric (which changes would then, and only then, affect the planets). The sun does influence the center of gravity of the solar system; it "pushes" it and holds it where it "stands" on the "historical line" of expansion. Its "pressure" on the center of gravity gives the amplitude of "deformed" space that the solar system possess (defining its gradual metric). Factualy, to my opinion, the only moment that a volume of "deformed space" isn't anymore affected by the disparition of its "sun" (star), is when the center of gravity of a "deformed space" attains the status of a singularity (black hole). Then whatever still orbits around its event horizon, isn't affected. So, not only, must we not consider "space" as we consider "matter", but we must also consider that the main actor of events in the universe is "deformed space" and not "mass of matter". 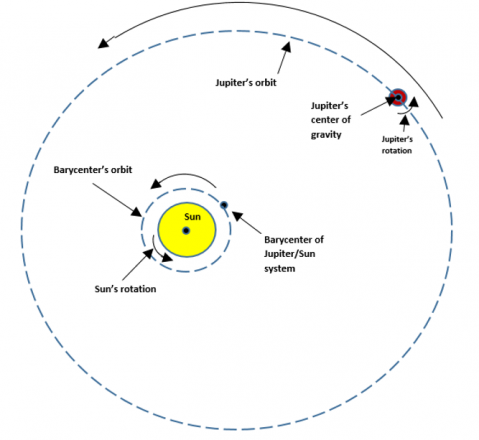 On the other hand, for the benefit of science fiction fans, if we "displace" the sun from the center of gravity of the solar system, the whole system will follow the barycenter (of that system) which will replace itself exactly where it actually is inside the sun, at his new location. But don't think that the event will not produce "inconvenients" in the interelations of the different "volumes of deformed space" inhabiting the solar system. That would be preposterous. If it was so for stars and planets, it seems to me that it should be the same for satellites, namely that their own metric should be waiting for us to send them in orbit. That way, everything would have been previously planed, there would be no hazard, and that's precisely what you believe. An orbit, inside a deformed space volume, doesn't exist before an object enters that deformed space at a certain speed. The metric is there; that's a fact. But a "metric" is neither an orbit nor a potato and certainly not a trajectory. If the speed is not fast enough, the object directs itself to the center of gravity. If the speed is to great, the object exits the deformed space volume, and continues through space. There is a "margin" of speeds that permits the object to place itself in orbit. And it is the speed that determines where that orbit will install itself. I have great difficulties in reading this kind of "reflexion", because of the "quality" of deduction needed in order to make a link with a far earlier idea, that is quite simple to understand, but not considered intelligently because of dumb "beliefs". Sorry to have to point it out. Do you know why you need to think so? Irrelevant here; but you must be aiming to something. PS. I reread your opening post, and I fell on your mass/energy concept, which adds to the collapsed metric, but as if it wasn't part of the massive bodies that are carrying it since if we take the body away for a while, the mass/energy stays at the center of gravity while the body is away. Do you really think it makes sense? I've copied your P.S. here to look at it. "Mass energy" produces a volume of space geometrically deformed , that permits "accretion" of matter particles, around a center of gravity, starting at the quark level. So, it's the volume of space deformation that "carries" matter; not the other way around. Do you really think it makes sense? I think that it is your lasts science fiction scenarios that don't make sense. Last edited by Andrex on February 20th, 2017, 11:22 am, edited 7 times in total. "What happens is, while brushing by one another to closely, the two center of gravity get caught in a “tide effect” that joins both centers into one single center, thus augmenting the “gravitational power” of that new center of gravity and making the joined deformations of their space-time, quite a bit larger. As for the two particles, as soon as the new center of gravity is determined, both of them tries to get to it and occupy the position." What you are describing is not a tide effect, it's a gravitational effect. A tide effect would be affecting differently your two particles, for instance if they would be orbiting another body while rotating one around the other in their orbiting plan. Last edited by Inchworm on February 20th, 2017, 11:32 am, edited 1 time in total. Did you change your mind or did you make a mistake? And what about the eight minutes it takes for us to see that the sun is no more there? Will it take eight minutes for the metric to change at the distance the earth is from the sun? Me too, but we get different answers. Maybe you need to be absolutely certain that what you do will give the result that you want. Do you have the feeling that you always had such a result? What you are describing is not a tide effect, it's a gravitational effect. A tide effect would be affecting differently your two particles, for instance if they would be orbiting another body while rotating one around the other. Which could simply proves that you don't understand what a tide effect is. But it might also be because you're not aware that I was talking of the process related to the first two particles that joined. Accretion (which is a gravitational effect like orbiting also is) cannot start before a "barycenter" is established. You must have read a little bit more which as shown you that neither of the two particles succeeds in "occupying" that barycenter. I made no mistake and I didn't change my mind. As for the eight minutes, they don't have anything to do with the metric; they're related to light-speed. Regarding the lap of time to change the metric after the sun being removed, I'll wait untill you remove the sun before answering; your question might change. Maybe you need to be absolutely certain that what you do will give the result that you want. Do you have the feeling that you always had such a result? I'm not certain of the result even today, since I'm always trying to find flaws in my opinion; and it doesn't seem to bother me very much. In fact I like it. And, yes, I always liked it. Andrex » February 20th, 2017, 10:39 am wrote: You must have read a little bit more which as shown you that neither of the two particles succeeds in "occupying" that barycenter. 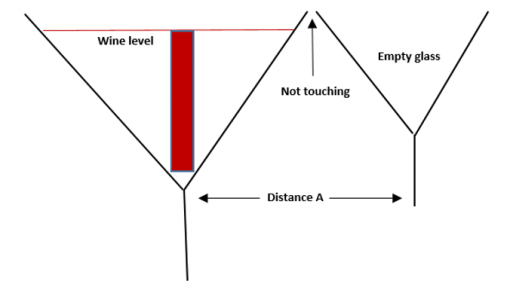 The tide effect would affect differently the two sides of your particles, because they are not at the same distance from their common center of gravity. Chose another name, what you describe doesn't respect the definition of a tide effect. I made no mistake and I didn't change my mind. Then you were not clear, and you aren't more now. You seem to want the baby and the water. I have a little prediction and am curious if you agree. 1. The Moon would fly away from the Earth, drop out of or losing its orbit. 2. The Earth & Moon would both be very inflated in diameter. 3. There would be no Gravity on the surface of either (Earth or Moon) at first. A: Keeping the Earths rotation speed would toss everything away from the surface (air, water, sand, cars, people.. etc). B: The Earth would probably fly apart due to internal pressure and rotation. C: The Earths debris field would (mostly) eventually collapse back together again, sans Moon, into a new (junk) planet. The part I like the best is the prediction that there would be no initial Gravity on the Earth's Surface. If the Earth didn't shatter, then it would slowly reduce in size over time and slowly regain its surface Gravity. I would think this prediction would be in wide violation of current Physics perceptions and their Math. We're not talking of the effect on the particles; we're talking of the "action" of the volume of space deformation of each particles joining, and its process while being done. because they are not at the same distance from their common center of gravity. Wrong. They are exactly at the same distance from their barycenter. And both have exactly the same size 10^-15 meter. We're talking of the two first particles that "merged" to a mutual center of gravity. Chose another name, what you describe doesn't respect the definition of a tide effect. It respects exactly the definition I gave you of a tidal effect. I don't really care of wiki's definition. Sorry. I might not be clear enough for you; so keep on asking questions. I don't mind logical ones. Nice way not to move for the rest of our lives! I already moved enough I and am still moving quite a bit, if I may say so. I Dave, let's have it! I love numbered descriptions; it's a lot easier and clearer to address. Thanks. 1) their kinetic energy doesn't have to be allowed being kept, it's their "proper" energy. So in the event formulated here, the moon would still orbit around the earth since, in fact, you wouldn't have relocate the planet earth, but the earth/moon system. So the system would still operate normally. 2) Neither earth or moon would be inflated. 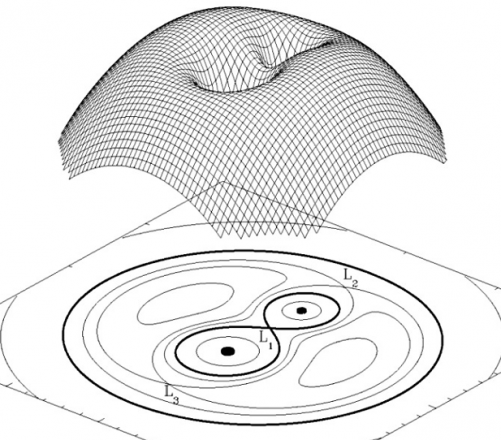 The topology of a volume of deformed space is a bubble that is completely seperated from the topology of "expansion". 3) Why do you say "at first"? Both deformations would be the same; so the gravitational effect would also be the same. Number three takes care of all the consequence you presented. Nothing would be change and no such consequences would happen, I think. A) Gravitation would be the same so nothing would be thrown away by rotation. B) The pressure inside the earth would not change and would still be controled by the gravitational effect. c) Why would the debris reform a planet if ever it was torn apart? It would mean that gravity would have dissapear and then reappear? Nothing of all that would happen. Unless you give me a reason that I don't see. I can't see why there would be "no initial gravity" on Earth's surface. And I can't see why Earth would slowly reduce in size over time whitout adding "mass energy" to it. I don't think that my answers violate current physics; at least I don't think so. You tell me. because they (their sides) are not at the same distance from their common center of gravity. If the particles have a dimension, then their sides cannot be at the same distance from their common barycenter. If we change the meaning of words, it is impossible to understand what we mean. I don't think that my answers violate current physics; at least I don't think so. They were when you said that the trajectory of planets would not be affected by a missing sun. Now you say the contrary, but you cannot link bodies to the mass/energy that they add to their center of gravity. Your mass energy is the same as mass, but you need to dissociate bodies from space, so you invented a name to be able to play on both plans at a time. That's exactly what Einstein did when he invented his curved space. I guess it's my turn to try to figure out your way of thinking. Both particles have the same size. So, please, explain your problem clearly. Didn't I say that previously somewhere? But what words exactly are you talking about? Mass? Mass is a volume of "matter"; this matter" contains energy called "mass energy". Curiously, the "mass energy" is not always equal to the amount of "matter"; sometimes there is more "mass energy" than there is "matter". That's why we have to be specific. They were when you said that the trajectory of planets would not be affected by a missing sun. The orbit of the moon is not affected by the absence of a sun, in Dave's description. So you'll have to be a bit more clear than that in your comment. Isn't that a shame!!! But didn't I just tell you that mass is not the same as "mass energy"? so you invented a name to be able to play on both plans at a time. That is what I call "gratifying"; I invented the term "mass energy". I would never have imagine Thank you very much. That's exactly what Einstein did when he invented his curved space. Did he invent "curved space"? I though he proposed that a deformed geometry of space was the cause of that consequence called gravitation. I must be mistaken. Sorry. This can be resolved if you define the literal Difference between Flat Space and Deformed Space. My hypothesis is based on the concept that the Planck Length is shorter on the surface of the Earth than what would be found in Flat Space. That Curvature is actually a gradient difference in Planck Lengths. It's this Gradient Difference that causes Gravity. Said more simply: The Planck Length is not a Universal Constant. It is comparatively smaller near a Black Hole than out in Flat Space. The Physical Space around a Black hole is Compressed (Reduced Scale). This is my Metric and Matter scales itself to the local Planck Length. I may be wrong, but I believe this is why Black Hole Math produces singularities. My version keeps the laws of Physics valid at all times. Do you agree that the sun-tides on earth are due to the dimension of the earth with regard to the suns' metric, that the two sides of the earth do not experience the same metric? We were talking about tides, not mass. Besides, mass is not a volume of matter, it is a property of matter. I wasn't talking about Dave, but about your affirmation that the earth would follow the same orbital trajectory if the sun was removed. Mass is not a volume of space, so if it's not mass that affects the metric of space, then it is useless. There's a difference between your Planck's length and mine. Mine is constant. Because, the universe started at that lenght. 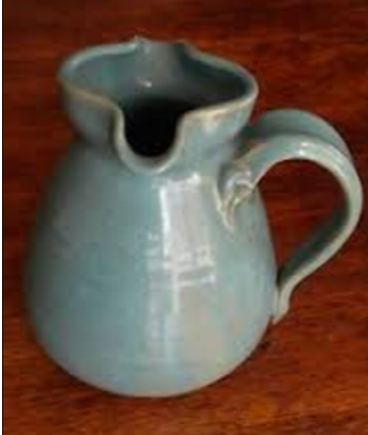 It is the smallest length possible in our 3D universe (volume). From that point it started to expand in "successive lengths" based on that smallest possible length. So there cannot be "one Planck's length and a half" (+ 1/2 of Planck's lenght); because "half a Planck's length" is not observable. It has to be two Planck's lenght; then three and four etc. So the Planck's length is the basic of all metric of expanding space. Whenever a length contracts, it cannot contract further than one Planck's length; we can also add that it contracts gradually, one Planck's length "at a time". Thanks Dave; you permitted me to add to the precision in the consequences to expanding Planck's length. Not exactly. I agree that tidal waves are produced by the intermixing edges of space deformed volumes disregarding their volume, but in line with their respective center of gravity. When you have a deformed volume of "space" orbiting inside a bigger deformed volume of "space", each sides of the smallest circonferences of deformed "space", in line with the centers of gravity, are in contact with a different metric of the bigger deformed volume of "space". But that is irrelevant; the importance lies in the lowering of level at those two "sides". The tidal effect is "felt" each sides of all volumes of space and those "lowerings" in the deformed volume of space don't rotate (neither does the deformed volumes of space). It stays in line with both centers of gravity. The movement observed on a "matter accretion" inside those deformed "space" is the "response" to the tidal effect. Solid matter responds less than liquid matter. Tides? Ok. But the property of "matter" is mass energy. Most people see "mass" as a "bundle" of matter. And what do you say about the explication that followed? Only that I changed my mind? If you agree that mass is not a volume of "space", we're halfway there. Good. Now what provokes "accretion"; mass of matter or deformed space? As for matter, it's not useless since it permits to augment "mass energy" at the center of gravity of a bigger mass of matter, intensifying then the volume of deformed "space" when matter is in contact. So space is curved? Explain that curve to me; I need it. Andrex wrote: each sides of the smallest circonferences of deformed "space", in line with the centers of gravity, are in contact with a different metric of the bigger deformed volume of "space". It took a while, but what you are describing now respects the definition of "tide", and your description of the two interpenetrating glasses did not. Your two glasses show how two deformed spaces would interact, but it doesn't show the result on matter, and that's what tides are about. But the property of "matter" is mass energy. Most people see "mass" as a "bundle" of matter. I don't see mass as matter, I see it as a metric, just like you, but a metric that comes from the accumulation of a constant time shift between the steps. That shift would have to be nullified by the steps the same way they nullify doppler effect, and since it would be a redshift, they would be lengthening their steps, thus accelerating their pace towards the source of light. The more the distance would increase between two particles, the more the redshift would increase, but the more its intensity would decrease, which corresponds to the kind of calculation we have to make to send satellites on orbit, or to justify any orbital trajectory. I know you don't like the idea of a pulling force, but your collapsed metric principle does exactly the same, except that mine is a mechanism between light and sources of light, two phenomenon that we can study directly, whereas yours is an ad hoc principle that Einstein invented to bypass the difficult problem of gravitational interaction. I don't know. In fact, I was a bit angry about you, and you still did not explain why you said the contrary formerly. You always say you stick to the facts, then tell me what happened. What provokes accretion is gravitation, and I don't believe in Einstein's GR, so I prefer my small steps for the moment. There seems to be no difference between what gravitational mass does and what your mass/energy does, so it is only complicating your explanations. I don't have that problem with my small steps, and they do the same thing your metric is doing. We both know what curved space means, so when I use it instead of "collapsed metric" space, you should understand it is only because it is shorter. Chose an acronym that is short enough, and I will use it. What about cms? The error in interpretation here is that the total "curve" of the mesh should be concave instead of convex, since we stand in the "denivellation" of altered space around the sun. There is no more tidal effect for bodies situated at Lagrangian points than there is for satellites. Their dimensions are too small to be affected by the difference in the metric from one side to the other. You said you intended to use those points to explain a certain form of accretion, so I assume that you were talking of points four and five, around which bodies travel in a bean form trajectory. I'm not sure, but I suspect that this bean motion would avoid accretion to be possible, thus to a kind of gravity center to develop. There is a software that calculates the motion of the bodies that would be orbiting at those points, it shows them in motion, did you see it? I can't find the link anymore. Your two glasses show how two deformed spaces would interact, but it doesn't show the result on matter, and that's what tides are about. As usual you're not concentrating on the real subject and, again, are deviating from it. My wine glasses intended to explain the source of the "tidal effect"; no the tides. The "effect" is cause by the lowering of the glass edges where they "interpenetrate. Tides are the results of that "effect". Don't put me in the same bag; you seem a lot more "special" than I am. Because I don't see mass as a metric; I see mass as a "bundle of matter" just like most everybody else. And that's why I use the term "mass energy" in order not to be misinterpreted. but a metric that comes from the accumulation of a constant time shift between the steps. This is even worse to understand; for me that is. and since it would be a redshift, they would be lengthening their steps, thus accelerating their pace towards the source of light. Here, I can "see" the wavelenghts diminishing because of expansion when I move toward the source of light. The problem is that there's no expansion around me; so are the wavelenghts expanding while light is getting farther from its source or is it something else that "dimmers" the light? I don't know.. for now. But you know, it could well be that photons collapse with air particles; I say "maybe". "Redshift" being an increase in wavelenght; ok. But you said earlier : "they would be lengthening their steps, thus accelerating their pace towards the source of light." So how can they accelerate their pace toward their source of light if they're getting further away from it by lengthening their steps? You'll have to "add" energy. which corresponds to the kind of calculation we have to make to send satellites on orbit, or to justify any orbital trajectory. If you say so; but, personally, I don't calculate orbital trajectories. The final "result" might be similar but the explanation of the event is completely different. And "explanation" is the secret to "understanding"; but maybe you don't agree since your purpose is to put satellites in orbit. whereas yours is an ad hoc principle that Einstein invented to bypass the difficult problem of gravitational interaction. It bypasses it alright! And it's a good thing because "interactions" are "mutual actions" and gravitation is a completely "passive consequence" of altered geometry; not a "mechanical engine" of "bundle of matter" that "attracts" other "bundles". 5)Light travel time delay testing which gives agreement with general relativity at the 0.002% level. What happenned is that "I stuck" to the fact that space doesn't rotate because stars orbit. The individual trajectories of the stars don't "subjects" surrounding space; they are the one subjected by surrounding space. There is no relation between those two "facts" "space" and "trajectory"; the relation is between "space geometry" and "trajectory". Precision, once again, is essential to exact comprehension. And, to me, gravitation is a volume of space that is "altered" in its metric; so when an object goes through that volume of space, it's gradually directed toward the center of gravity where "massive particles" accumulate; that is the "event" that we call "accretion". There seems to be no difference between what gravitational mass does and what your mass/energy does, so it is only complicating your explanations. But the term "gravitational mass" doesn't mean anything specific that can "do" something; while the term "mass energy" is energy that clearly can "do" something. For example the "massive Earth" doesn't deform space; it's the "mass energy" of Earth, pushing on the center of gravity, that does it. If you put Earth, alone in "flat" space, the "push" will be made on the center of gravity of the space deformation around the planet and it will correspond to the center of gravity of Earth. But if you put Earth near another planet, both alone in space, centers of gravity of both planets will shift and a third center point will appear called the barycenter of gravity of the system. This appearence of a third center of gravity doesn't eliminate the center of gravity of each planets; it only designs a center point of gravity where the system equilibrates their motions. If ever the two planets collide, they will "merge" center of gravity", eliminating both senter of gravity to form a single one that will, then, augment the alteration of surrounding space. I don't have that problem with my small steps, and they do the same thing your metric is doing. That's exactly what I try to figure out. No, I hate acronyms. CMS could mean "Cage my syster"; then you would really "Confront my sister" and you could "Capture my syster" which woulld give you and me as lot of problems. So I'd like you to say if you're aware that a "gradually decrease in metric of space" is not at all a "curved space"; but that it produces "curved trajectories". Just to make sure we really do understand each other's meaning. There is no more tidal effect for bodies situated at Lagrangian points than there is for satellites. Their dimensions are too small to be affected by the difference in the metric from one side to the other. Then explain to me why there are only two Lagrangian points that are "perfectly" stable for a satellite. What prevents the other ones to be "perfectly" stable? You said you intended to use those points to explain a certain form of accretion, so I assume that you were talking of points four and five, around which bodies travel in a bean form trajectory. What are you talking about with the "bean form trajectory"? Lagrangian points 4 and 5 are just as fixed as the others. I don't understnd your question. Are satellite standing on those points orbiting in a "bean form trajectory"? What is your point of reference to see it that way? but I suspect that this bean motion would avoid accretion to be possible, thus to a kind of gravity center to develop. There is no "bean motion trajectory" when two "bundles of matter" collide or join in space they get closer and closer together, turning around a barycenter, and finally merge together. That is called accretion but while the deformed space around each "bundles" start touching, a tidal effect occurs that brings them to merge their "deformed volume" into a bigger one. That "tidal effect" is what "attracts" the bundles to one another. There is a software that calculates the motion of the bodies that would be orbiting at those points, it shows them in motion, did you see it? I can't find the link anymore. Never saw it. But simulations results are according to informations put in the computer. If the informations are wrong what would you expect? Furthermore, that could be the reason why the link doesn't exist anymore. No, tides are the result of the metric from one of the bodies affecting the different parts of the other body differently because of its dimension. Tides are due to the dimensions of bodies, and the metric alone cannot account for dimension. For instance, a body could have a smaller dimension and still have the same metric as another one because it has the same mass, but it would not have the same tides. Doppler effect is such a time shift, and the cosmological redshift too. Look at the steps: even if they produce doppler effect with regard to the other atom, no doppler effect is perceived by that other atom because, at the moment light reaches it, it is moving exactly at the same speed as the other atom. Here, I can "see" the wavelengths diminishing because of expansion when I move toward the source of light. The problem is that there's no expansion around me; so are the wavelengths expanding while light is getting farther from its source or is it something else that "dimmers" the light? I don't know.. for now. The simpler way is to imagine that the frequency of the steps increases with time, so that the steps we see in the past are slower than now. That's what could be causing cosmological redshift, and the steps would have to move to nullify it the same way they do in my animation, except that this time, it would cause gravitation. Usually, that acceleration justifies the orbital motions, so it is constantly compensated by the centrifugal motion of the bodies, which is executed by the small steps from their atoms. It's those steps that I want to study more closely, to see if they can coincide with your metric at the atoms' scale, the one that begins with the gluon. The steps that would justify gravitation are a bit more uncertain, and one has to understand very well those of my animation before studying them. One way or another, something has to move with regard to something else, and to me, attributing that regard to space instead of attributing it directly to bodies is misleading. GR is a theory, not a fact. What happened is that "I stuck" to the fact that space doesn't rotate because stars orbit. The individual trajectories of the stars don't "subjects" surrounding space; they are the one subjected by surrounding space. There is no relation between those two "facts" "space" and "trajectory"; the relation is between "space geometry" and "trajectory". Precision, once again, is essential to exact comprehension. You are again neglecting the fact that it is the stars that are responsible for the space geometry of their galaxy. You can't take the stars away otherwise there will be no more space geometry at that place, and you can't compensate the speed the stars have with your geometry, you have to add a specific geometry for the speed, and my small steps can do that because they explain the speed, and also the direction, which is by the way as straight as your metric. But the term "gravitational mass" doesn't mean anything specific that can "do" something; while the term "mass energy" is energy that clearly can "do" something. You are adding a term that means the same as the old one, and it took me a long time before understanding that, so either you say it at the beginning of your writings, or you keep the old one and you explain what it means to you. Because if you give a body that is at point 4 or 5 a small push, due to the particular geometry of that three bodies problem, it automatically starts rotating around that point in a bean shaped fashion. Are satellites standing on those points orbiting in a "bean form trajectory"? "When a body at these points is perturbed, it moves away from the point, but the factor opposite of that which is increased or decreased by the perturbation (either gravity or angular momentum-induced speed) will also increase or decrease, bending the object's path into a stable, kidney-bean-shaped orbit around the point (as seen in the corotating frame of reference)." Wouldn't it be simpler to consider that each bundle has a geometry that captures the other bundle? Space-Time distortion as a grid. Notice I colored in two squares of your Grid. If you believe the number of Planck units inside each square are unequal, then no Distortion can exist. However if they are Equal in Number but of Different Sizes, then I agree. We're talking about "tidal effect"; not "tides". Tides are due to the dimensions of bodies,...For instance, a body could have a smaller dimension and still have the same metric as another one because it has the same mass, but it would not have the same tides. The metric of a body changes every Plank's lenghts, as you get nearer to the center of gravity; so all bodies have the same metric somewhere inside them, whatever their size. Tides are the results of "inter-reactions" between volumes of deformed space because the "gravitational force" doesn't exists. With your steps (and with Newton) you have to consider the "step in front" and the "step toward the center of gravity" to try to explain all this "tidal effect" because you use the "gravitational force"; with geometry it's a lot simpler to understand. And most people will think that you're talking of a "boulder of matter". So do as you want, but don't think that you'll be able to make yourself understood. And I though that it was related to the wavelengths. I'm learning a lot here. it is moving exactly at the same speed as the other atom. I'm looking; Oh god almighty am I looking!!! But what I see is while one dot is stopped, the other one is moving. I don't see them moving at the same speed at all. Now if you mean "when each moves, they do it at the same speed", then that is something else. My question becomes: "Why the h... are they stopping? What prevents them to move continuously? Why isn't kinetic energy provoking a "continuous work". The simpler way is to imagine that the frequency of the steps increases with time, so that the steps we see in the past are slower than now. Which means, if we put all your infos together, that increasing frequencies lengthened the waves. I thought that frequencies augmented when wavelength contracted (diminishes). But if the lenght gets longer, while increasing frequency it should take less time to cover longer "steps". But that's an awful big "If" and it doesn't fit with any experiences known. Acceleration that is "compensate" do you mean that there's no acceleration observed by a non observed centrifugal "motion"? Coincide in what subject: lenght, time, speed, intensity...? The steps that would justify gravitation are a bit more uncertain, and one has to understand very well those of my animation before studying them. Please don't ask me before I go listen, for 2 hours, some "rain noise" that eliminates stress. That's exactly why I don't attribute it to "space" but to it's geometrical decreasing metrics. That's what they use to say in 1920. It became a "fact" since. You are again neglecting the fact that it is the stars that are responsible for the space geometry of their galaxy. Because that is a "belief" and not a "fact". Stars in a galaxy are responsible strictly of the decreasing metrics of their own personal deformed volume of space; not the galaxy's. Where does THAT come from? The geometry of the space of the galaxy will still be there. You're saying that if we take out the Earth from the solar system, there will be no more "space geometry" where the Earth was? Be serious for a minute! No "space geometry" means no "space" at all. So you're aware that "altered metrics of space" are not "curved space". So why do you want to use "curved space"? It wobbles a bit (maybe in a bean shape fashion becuse the lagrangian point orbits around a center of gravity) and rapidly comes back to its original place like if at the bottom of a bowl. They don't; but give me the link to wiki. "Equilibrium at the L1 and L2 points is unstable, like that of a marble perched atop a bowling ball. If positioned exactly on the top, the marble will stay in place, but the slightest push will make it move further and still further from equilibrium, until it falls off. By contrast, the equilibrium at L4 or L5 are like that of a marble at the bottom of a spherical bowl: given a slight push, it rolls back again. Thus the spacecraft at L4 or L5 do not tend to wander off, unlike those at L1 and L2 which require small onboard rockets to nudge them back into place from time to time"
Geometry of a bundle doesn't capture anything; it's too solid and stars in a galaxy are certainly not capture by a "bundle". A volume of space captures things. If you believe the number of Planck units inside each square are unequal, then no Distortion can exist. First, let's specify that the Plank's unit (cubes) can't be "distortioned; otherwise they wouldn't be keeping a Planck's length uniformity. Here we have to take care; "holes" and "bumps" don't exist in a decreasing metric toward a center of gravity (so they are not equal going to center, but they are equal at each orbiting levels decreasing every level while getting nearer the center). The mesh here is a representation of "distortioned" space and is not the exact representation of the "fact" (it's as inexact as the ball on the tight blanket). I've been trying to draw an exact picture of what would be like a tri-dimensional decreasing metric of a specific volume; but I can't. I don't even know is such a drawing program exists to put in a computer. So I use what I can find on the net. I hope I made myself clear. Thanks. Andrex » February 21st, 2017, 7:29 pm wrote: The metric of a body changes every Plank's lengths, as you get nearer to the center of gravity; so all bodies have the same metric somewhere inside them, whatever their size. Tides are the results of "inter-reactions" between volumes of deformed space because the "gravitational force" doesn't exists. With your steps (and with Newton) you have to consider the "step in front" and the "step toward the center of gravity" to try to explain all this "tidal effect" because you use the "gravitational force"; with geometry it's a lot simpler to understand. I understand how the geometry works, but I still think it misses a motion: it may not rotate, but bodies do, and it doesn't account for their motion. That motion is the first one my steps account for, and it is very easy to understand how they do that. I'm sure it would help you to improve your theory if you would understand them. And I thought that it was related to the wavelengths. Wavelength is directly related to frequency, and you probably know it, so why this answer? Are you answering too fast or what? I have the feeling that you do not read the whole post before answering. Catastrophic! :0) Its even worse than I thought. You didn't even notice that the steps were caused by doppler effect. You're absolutely certain that I am wrong, so you make no effort to understand what I say. And you think you have no beliefs? :0) What the steps do is begin to move as soon as they see the other atom moving, and they do not move at the same time because it takes time for light to travel between the two atoms. In other words, we see them not moving at the same time, but they see themselves doing so. Keep in mind that it is the steps that are responsible for the light that we see. When looking at distant galaxies, we see the steps as they were in the past, thus when they were less frequent than now, and we can measure the difference while comparing the light from that time to the light from our time. This way, redshift might not only be due to expansion of space at our scale, but also to contraction of space at the particles' scale. And it would not only be an effect, it would also carry the information for gravitation, thus for the atoms to accelerate their steps one towards the other in order to stay synchronized. If there is no orbital motion, then there is no centrifugal motion, and the body accelerates towards the center of gravity of the other body. Your metric is a distance over a time, and it varies with the distance to the center of gravity, just like my steps. Absolutely not. Theories will always be theories. Do you expect your theory to become a fact? If so, you may be trying to use your imagination to change your instincts, which is impossible. And what is responsible for the decreasing metric of the galaxy? A black hole? And what is responsible for the decreasing metric of the black hole? Nothing? Good for your mind maybe since you seem to need to clean it sometimes, but not for mine. I need that my theory becomes useful one day. No stars and no planets also means no space. Wake up, you're too far ahead in your imagination, you're getting out of reality. It's a dictionary's definition that I did not find anywhere else than here. What they really mean is the energy of mass, which comes from the equivalence between the two terms, so the term mass-energy is no more than a tautology. Because it has the same meaning for the scientific community, and because it is shorter. It wobbles a bit (maybe in a bean shape fashion because the Lagrangian point orbits around a center of gravity) and rapidly comes back to its original place like if at the bottom of a bowl. "What gives L4 and L5 their stability is simply the Coriolis force discussed previously. Initially, a body at L4 and L5 start moving away from the equilibrium point but, as the body pick up speed, the Coriolis force takes effect sending the body into an effective orbit around the Lagrange point. Because of this effect, the areas around L4 and L5 that are effectively stable are in fact quite large as is illustrated by Figure 1. Indeed, this is the reason that so many trojan asteroids exist, some more than 5 degree off 60 degree, where the L4 and L5 are located. No satellites have been placed at these locations (unlike Land L2 hosting the SOHO satellite and the WMAP satellite respectively, despite their inherent instability), however, they were visited in 2009 by the STEREO satellites. 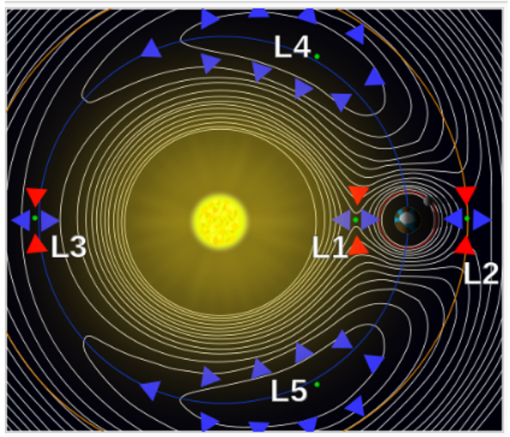 As the only stable Lagrange points, L4 and L5 are unique phenomena in the solar system and the areas around them have been and are of great interest (for example as possible places of origin of the moon or locations from which to better observe solar storms) to the astrophysics community." I understand how the geometry works, but I still think it misses a motion: it may not rotate, but bodies do, and it doesn't account for their motion. It doesn't have to. Space has to exist primarily in order to "contain" motions observable. I'm not sure since I wouldn't account for the pre-existence of "space". Drop that feeling; doppler effect are directly related to wavelength which by expanding changes its frequency. It's not the frequency (energy) that controls the doppler effect; it's the expansion of the wavelength that affects the frequency. You didn't even notice that the steps were caused by doppler effect. In fact "double doppler effects" (to and fro) which are the "light informations" emitted by both "dots" toward each other. This is what I understand until now. Ok. So where do I get the confirmation of this exchange of informations? Let's say "feel" instead of "see". So this is a "premise" that I have to accept, because nothing indicates that informations are effectively exchanged. Ok. I'll accept it for a few seconds. and they do not move at the same time because it takes time for light to travel between the two atoms. I agree that it takes "time" if light "travels". But let's say it does. Now the size of a nucleus is 10^-15 meter and the wavelength of a gamma ray is 10^-14 meter. The question become how much "space" is there between your atoms? In other words, we see them not moving at the same time, but they see themselves doing so. What does this phrase mean exactly? We see them move one after the other but they see themselves moving simultaneously? Keep in mind that it is the steps that are responsible for the light that we see. The light is information given between atoms in order to synchronize their motion; now, that light becomes the one we see. How do you explain it? When looking at distant galaxies, we see the steps as they were in the past, thus when they were less frequent than now, and we can measure the difference while comparing the light from that time to the light from our time. When I look at a galaxy, I see a galaxy. The galaxy I see is the image created by the light coming from that galaxy. Since light "travels" at an "invariant" speed, the time it gets to my eye is relative to the distance of the galaxy. Now, frequency is inversely proportional to wavelength. Which means that the "energy manifestation" of a wave is related to its length. This also means that the expansion of the universe affects the "energy manifestation" of a lightwave, since it expands its wavelength. So if I try to superimpose your steps on the frequencies, you say that the steps nearer to the source where "less frequent" than the steps nearer to us. That is exactly the contrary of "frequencies". So make all this clear to me please. This way, redshift might not only be due to expansion of space at our scale, but also to contraction of space at the particles' scale. And it would not only be an effect, it would also carry the information for gravitation, thus for the atoms to accelerate their steps one towards the other in order to stay synchronized. First of all, orbital motion (in fact orbital trajectory) doesn't produce centrifugal "effect" (and not "motion"). There's no cable attach to the objects. The orbital trajectory (and not "motion") is a result of an object traveling through the "deformed geometry of space". It doesn't "endure" or "suffer" anything. It is not "subjected" to anything beside its own proper speed. It doesn't care of anything else than the "road" in front of him and it follows that road (determined by its speed), plain and simple. It's unbelievable how difficult it is to erase that damned notion of "forces" from someone's mind. I wouldn't believe it if I didn't observe it so frequently. Don't change definitions. My metric is an "invariant" measure of 10^-33 meter, that is duplicated constantly by the expansion of the universe. The duplication of that distance in all directions produces "space". That space is observable because the velocity of the duplication is less than light-speed; and those observable distances can be also "observed" as "time length" which is the equivalent. Just wait for an intuition to hit your mind! No need to get stressed, it doesn't hurt. If ever such a thing happens, I'll re-start believing in "hazard". Absolutely not. Theories will always be theories. Do you expect your theory to become a fact? "Facts" are the reality that exists. They cannot be changed by opinions. Theories are "suggested opinions" that tries to describe these facts. When a suggestion is observed and proven, it becomes a "fact". Otherwise you end up at the table of Jeannette and starts to talk the talk. Today, "altered geometry of space" is a fact observed. If some still consider it as a "theory", it's simply because they can't get rid of the notion of "forces" impregnated in the formula they use every day, as much as in their minds. A star cannot be captured by a galaxy unless the galaxy is already there, which means that it already contains billions of stars. Galaxies collide and when that happens some stars are "captured by either galaxies. A wandering planet can be captured by a star system and the event is exactly the same I described in the link. You are again putting the cart before the horse, trying to imagine that space collapses without the presence of matter. How many times did that happen yet? When did I say that space metric collapses without the presence of matter? Were you sleeping when you read my explanation how mass appeared in the universe, or you prefer the story of massless particles having problems going through molasse? I need you to develop our theories for real, not just in our heads! You better make certain that I can get your theory in my head if you want to get improvements from my part. Up untill now, it seems that only my own theory is improving. And what is responsible for the decreasing metric of the galaxy? The "mass energy" that pushes the center of gravity of the galaxy. A black hole? And what is responsible for the decreasing metric of the black hole? Nothing? Good for your mind maybe since you seem to need to clean it sometimes, but not for mine. The cause responsible of the decreasing metric of a black hole is the "pressure" imposed by the "mass energy", contained in the matter of the former massive star, upon its center of gravity, that made the star collapsed under the pressure. Do you have a "vacuum mind sweeper" near you; I guess you'll need it. The tone is changing quite a bit. We must be near the moment you might understand. So, in your mind (before sweeping), just taking one single example, when you put a log in the fire, it burns out and the space occupied by the log has vanished in smoke. It ceased to be present. Luckily space expansion exist otherwise half the space around us wouldn't exist anymore and since the growth of population is so important, we would be one on top of the other. It's a dictionary's definition that I did not find anywhere else than here. How many dictionaries do you need to learn a definition? What they really mean is the energy of mass, which comes from the equivalence between the two terms, so the term mass-energy is no more than a tautology. You would be right if, effectively, the amount of matter is always equal to the amount of "mass"; but I guess I'll have to wait until you learn that it is not always so. ; massive matter is not always equal to its "inner" energy. That's not a tautology expression; but it's definitly tautological thinking. I also saw it while searching; but since it didn't say anything clear except the importance of a "force" (Coriolis) I droped it. He does sound like an "expert; but "sound" doesn't mean anything by itself, it as to have "sense"; it as to mean something. This "expert" produced a "paper" read by the scientific community, good for him; but I don't think they'll read it twice. As you will find out, the title of this discussion suggested by Marshall on the first page, is now very adequate for my opinion on gravity. Thanks Marshall. I'm quite surprised by your "pre-vision". Just think about it, the “deformation of space geometry”, that Einstein talked about, cannot be anywhere else then in its “metric”. Simply because there is nothing else to be deformed in a volume of “space”. Logically, we understand that a “not deformed space” is “flat” space; and in order that space can be deformed, it has to be “flat”, in the first place. We also understand that in “flat space”, the metric has to be “constant”; it has to be an “invariant” metric. Which concords with the invariance of light-speed and the invariance of the "total energy" in the universe. This being acknowledge, let’s concentrate on “altered” space. So, this proposition says that, starting from the center of gravity, we find, there, the “smallest” metric (distance) of that whole volume of “altered” space. That metric varies with each "space volume" altered, since it depends of the amount of "mass energy" implicated in the "deformation". That first metric envelopes the center of gravity. It’s like the thickness of a space “corridor” defining an orbital metric around the center of gravity. A bit farther out from the center of gravity, just “outside” that first “corridor” (metric), we meet another “metric”, just a bit longer than the previous one (because expansion make metrics duplicate themselves and not: “stretch” them), that outlines another “orbital corridor”, larger than the previous one. And, so on, goes the progression of such gradually larger “orbital corridors”, until the volume of “altered” geometry, in fact, its last largest “corridor”, reaches “flat” space. No need to say that, being a “volume”, the “orbiting corridors” present a space “onion shape” structure. Now we will verify if each “orbital corridor” couldn’t have a speed characteristic. Which means that the metric it defines, would design a definite “distance” to be covered by “motion”. Everybody understand that a motion covering a “distance” implies describing a “laps of time”. So each corridor are then, characterised by a definite “distance” (metric) and a definite “time-lap” (metric/motion); which results in outlining a designated “speed” for each “orbital corridors”. Now how could we check if this can be a physical “fact”? We know that a “free falling” object is an object that is falling under the sole influence of gravity. “Any object that is being acted upon only by the force of gravity is said to be in a state of free fall”; but we discarded the possibility of the existence of a “force of gravity, by replacing it by a gradually decreasing metric. Even then, the fact is that when falling in “free fall”, an object accelerates at 9.8 m/s/s. The only difference is that when we adopt the “passive” geometrical state of “decreasing metric”, instead of a “force” that “acts”, there’s no more acceleration involved. Instead of accelerating, the object’s proper “speed” stays “constant;” but since the distances covered at this constant “speed” decrease, it gives us the impression that the object is “accelerating”. So this concept of decreasing metric is acceptable to explain the “facts” observed. But even so, the “concept of force” still holds its ground in front of the concept of “decreasing metric”. What experiment could decide which one is really the “fact”? We know that a satellite, in a circular orbit around the Earth, is in a “free falling” situation. And this is where we find our proof; because a satellite in free falling situation on a circular orbit, DOESN’T ACCELERATE AT ALL. It keeps a “free falling” constant speed while traveling inside its "orbital corridor". And that discredits completely the acceleration "law" stipulated by an "acting" force concept, since it doesn't apply to both "free fall" situations. It's now obvious: gravity is a "passive" geometrical situation; and not an "active" or "interactive" condition. So, why is that satellite not accelerating in “free falling” at a constant distance from the center of gravity of Earth, and would accelerate if it was “free falling” toward the same center of gravity? The only explanation to this discrepancy is our “orbital corridors”, which are defined by decreasing metric as an “alteration” of geometry of space. Traveling through decreasing metric "corridors" give the illusion of acceleration of the satellite, while traveling inside one such "orbital corridor" reveals a steady proper speed of the same satellite. It also becomes easy to understand why an elliptic orbit seems to accelerate and then, decelerate, the speed of a satellite. It's traveling through different "orbital metrics". I'm working on the explanation of what could cause elliptic orbits. I'll be soon ready to present it here. These “orbital corridors” also explains why stars, widespread on a great surface “corridor” around the center of a galaxy, orbit at all the same speed. Consequently, our “decreasing metric concept” eliminates the need for “dark matter” which, we have to admit, is essentially an “imaginary” solution. Furthermore, a "dark matter" solution that "acts" on gravity, is based on the "forces" concept which is anti-GR. I think that everybody will agree that the "decreasing metric" concept is far more simpler to understand and to apply at "observations" than all that "meli-melo" concept of "forces", so difficult to adapt to those same observations. Yes, but you want to dissociate space from bodies, and that kind of space alone cannot explain rotational motion: you have to add speed to your equation, a speed that my small steps explain also using space, but a space at the scale of particles instead of at our scale. My theory says we are all crazy, but not necessarily dumb. It takes time to change, even facing the obvious, that's all. You're talking of the redshift, and I was talking of doppler effect. Doppler effect is due to speed, and redshift is due to expansion: it's not the same phenomenon. For the moment, it's sufficient to accept that particles are exchanging information. Just imagine that their presence is affecting the metric of space, and that this metric is affecting in return their trajectory towards one another. It's similar to gravitation, except that they do not have to rotate around one another to stay at the right distance from one another: the information from the metric tells them the distance, and their small steps are executed to stay at that distance. It is not either the same form of metric than the one that produces gravitation, it has the form of a wave, and that wave creates a kind of standing wave between the particles since the steps they make are synchronized with it. Let's say "feel" instead of "see". So this is a "premise" that I have to accept, because nothing indicates that information is effectively exchanged. Ok. I'll accept it for a few seconds. You probably know better than me how to handle that metric stuff. What I think is that, to have a beginning and an end, the duration of a step has to depend on the time it takes for the information to travel back and forth between the particles. It means that, if we were at their place, we would not detect any doppler effect, but more importantly, we would not detect our steps either event if they are made of small accelerations. In other words, we would be moving as if we were in free fall, so we wouldn't feel the difference in speeds. If your gravitational metric is able to do that, then I don't see why a wave metric couldn't. The light that we see is escaping from the steps when they get accelerated from the outside, because then, they get out of sync. When they are not accelerated from the outside, the standing wave that is created between the particles produces the absorption of the waves by interference, which can produce an interference pattern where more than two particles can stand. This explains why atoms can have more than one bonding possibility. To understand what I say about redshift, you have to forget about expansion for a while. What I suggest is that the steps would be increasing their frequency with time, which means that actually, all over the universe, the steps have the same frequency, but it also means that if we observe the steps from the atoms of distant galaxies, then we will see that they had lower frequencies, because light doesn't change its frequency when it travels. I now cite myself: "This way, redshift might not only be due to expansion of space at our scale, but also to contraction of space at the particles' scale. And it would not only be an effect, it would also carry the information for gravitation, thus for the atoms to accelerate their steps one towards the other in order to stay synchronized." I don't see any mathematical difference between the two kinds of metrics, and both should produce the same illusion: looking outside towards galaxies, they should appear to be getting away from one another, and looking into particles, they should appear to be getting closer to one another, which is incidentally the same as producing blueshift, or getting more energetic, and we know that the more we dig, the more the particles get energetic. But the analogy is not perfect; it would if we could observe the blueshift, but how could we do that since at our distance from those particles, the shift would be infinitesimal. First of all, orbital motion (in fact orbital trajectory) doesn't produce centrifugal "effect" (and not "motion"). There's no cable attach to the objects. The orbital trajectory (and not "motion") is a result of an object traveling through the "deformed geometry of space". It doesn't "endure" or "suffer" anything. It is not "subjected" to anything beside its own proper speed. It doesn't care of anything else than the "road" in front of him and it follows that road (determined by its speed), plain and simple. It is not the geometry of space that produces centrifugal motion either, it's the speed, and you did not provide an explanation for that speed yet. Without speed, the analogy with the elastic fabric wouldn't work. It works only because the balls get some centrifugal motion from their speed. It's unbelievable how difficult it is to erase that damned notion of "forces" from someone's mind. I wouldn't believe it if I didn't observe it so frequently. I said centrifugal motion, not centrifugal force. Don't change definitions. My metric is an "invariant" measure of 10^-33 meter, that is duplicated constantly by the expansion of the universe. I was talking of the collapsed metric, not the flat one. A fact is an observation that anybody can reproduce, and what we observe from space is stars and galaxies, not space itself. Expansion or collapsing of space is thus a deduction, not a fact. If it was a fact, I would not be able to develop my theory on the small steps to begin with, because I don't like to look stupid. The steps are free-fall motion, so they develop no more force than your metric. It is only when they get out of sync that they develop mass, because they are then forced to change direction or speed, to which they resist. This resistance explains why objects deform or explode when they collide, and it explains why we offer resistance to the ground. These are also facts, and your metric has to account for them, otherwise it is not credible. What you say is the same as saying that the metric of each atom participates to the metric of the galaxy. The reason why we use barycenters is mathematical: we realized that we could integrate all the barycenters to calculate the resultant effect. I guess you're talking of the loss of mass due to bonding, and I already showed you how my small steps were a lot more straightforward than the usual analogy between mass and energy to explain that phenomenon. With the steps, mass, frequency, and energy, are not only equivalent, they simply share the same mechanism. I also saw it while searching; but since it didn't say anything clear except the importance of a "force" (Coriolis) I dropped it. The Coriolis force is not considered as a force, but as an effect, a bit like centrifugal force for orbital trajectories. A body that is sent directly to the north from the equator takes the transverse speed the equator has, so when it gets at the north pole, it always has this speed, in such a way that if you are at the pole, it will actually be traveling away from you to the east, and if we add the rotation of the earth to the apparent motion, it will be making circles counterclockwise. If you use my small steps as a metric for speed, then you can use that metric to explain that effect. Andrex wrote: Instead of accelerating, the object’s proper “speed” stays “constant;” but since the distances covered at this constant “speed” decrease, it gives us the impression that the object is “accelerating”. This doesn't make sense to me. To describe acceleration, I can imagine that the distances stay the same while time slows down, or that they increase while time stays the same, but speed is already a distance over a time, and that distance cannot stay the same while the distance traveled in space decreases. It doesn't work. To account for acceleration, I think you have to attribute your metric to acceleration, and then give it a density so that it can increase while your concentric circles are getting closer to one another. This way, the less the distance between the circles, the denser the metric, and the stronger the acceleration. That's why space doesn't rotate; rotation of matter is a result of accretion of particles, starting whit the to first one. I explained that already. The main reason is because I can't understand your "steps". Doppler Effect and redshift are two phenomena observed in the field of wave mechanics. Both of these phenomena occur due to the relative motion between the source and the observer. So where do I get the confirmation of this exchange of informations? For the moment, it's sufficient to accept that particles are exchanging information (so you say). Just imagine that their presence is affecting the metric of space (ok; they are massive particles), and that this metric is affecting in return their trajectory towards one another (in a straight line? Impossible). the information from the metric tells them the distance, and their small steps are executed to stay at that distance. It is not either the same form of metric than the one that produces gravitation, it has the form of a wave, and that wave creates a kind of standing wave between the particles since the steps they make are synchronized with it. That's a lot more than what we see in your animation. What I think is that, to have a beginning and an end, the duration of a step has to depend on the time it takes for the information to travel back and forth between the particles. In reality, to have a beginning and an end, all his needed is a "distance". Distances are define by lap of time travelling. Geez how dumb can I be! I cannot grab anything of what your trying to explain to me. I can't find any sense in it. I'm desperate; really. To me a "wave" is a distortion. I can't relate all that is sublined together. Sorry. I'll keep thinking about it while re-reading it. Same frequency all over the universe but what about where gravitation exist? but it also means that if we observe the steps from the atoms of distant galaxies, then we will see that they had lower frequencies, because light doesn't change its frequency when it travels. So you're now talking of light emitted by atoms of the "matter" that orbits in a galaxy (stars mainly). But each kind of "matter " has a different frequency; that's how we can distinguish different elements in galaxies. What is sublined is wrong; looking toward galaxies, they seem to be getting away "from us" and they seem to be getting closer to one another. That "effect" doesn't imply added energy; it's only an illusion resulting of "perspective". and we know that the more we dig, the more the particles get energetic. That's another affirmation I didn't know about. Explain it clearly. It is not the geometry of space that produces centrifugal motion either, it's the speed, and you did not provide an explanation for that speed yet. It's not a "motion"; it's an "effect". And it's a tangential "effect" produced on the surface of a "rotating" body. The speed is simply the same as the speed of rotation in a tangential trajectory. And you also explained that it was the speed that produced centrifugal "motion". How can "speed" produce a "motion" when it's simply a characteristic of "motion". You're saying that night provokes darkness. It's always the same metric of 10^-33 meter. It's an invariant distance (basic). So a star in not a fact, because you can't reproduce one. and what we observe from space is stars and galaxies, not space itself. We are not going to start that again. I admit that you can't observe "space" if you want; but I can; in fact I observed space every seconds of my life. Expansion or collapsing of space is thus a deduction, not a fact. The results are "facts" so the cause has to be a "fact". Which cause is the "fact" between Newton's concept and Einstein's concept? I think I proved it in the preceding post. If it was a fact, I would not be able to develop my theory on the small steps to begin with, because I don't like to look stupid. The steps are free-fall motion, so they develop no more force than your metric. If you would accept that a "step" is a "basic measure" that composes distances, it would be identical to my notion of "metric". But my metric doesn't originate from displacements of two particles; it originate from less than light-speed motion to make them observable starting at Planck's time. It is only when they get out of sync that they develop mass, because they are then forced to change direction or speed, to which they resist. The question then becomes: what puts them out of sync? This resistance explains why objects deform or explode when they collide, and it explains why we offer resistance to the ground. These are also facts, and your metric has to account for them, otherwise it is not credible. All these "facts" are accounted for in my "theory". What you say is the same as saying that the metric of each atom participates to the metric of the galaxy. Not the "metric" but the "mass energy" of each atoms. The reason why we use barycenters is mathematical: we realized that we could integrate all the barycenters to calculate the resultant effect. What does "integrate all the barycenters" means? The "mass default" I guess it's called in English. At least that's what it's called in French. With the steps, mass, frequency, and energy, are not only equivalent, they simply share the same mechanism. Mass, if your not talking of a "bundle" of matter, is a manifestation of kinetic energy. Frequency is a manifestation of kinetic energy. And energy is basically kinetic. So I guess they should be close related. The Coriolis force is not considered as a force, but as an effect, a bit like centrifugal force for orbital trajectories. So we agree that centrifugal is an "effect" of a rotating "motion". Instead of accelerating, the object’s proper “speed” stays “constant;” but since the distances covered at this constant “speed” decrease, it gives us the impression that the object is “accelerating”. If this doesn't make sense in your mind, I cannot find a better way to describe it. So, in your mind if you go at 100 m/hr and your 100 miles "contracts" gradually down to 50 miles, you won't have the impression of accelerating while still going at 100 m/hr? Never mind the speedometer of the car. That's why space doesn't rotate; rotation of matter is a result of accretion of particles, starting with the two first ones. I explained that already. You still did not explain speed. Expansion of space has been invented to avoid galaxies to be exceeding the speed of light, which means it has been invented to bypass relativity, so it is not a relativistic phenomenon, and redshift either. It is expansion that is considered to stretch the waves, not motion. In other words, galaxies are considered at rest while space is stretching. I always said that the steps had a wave form that had to correspond to the wave that was producing them. Gravity is also a distortion, but we don't feel it in free fall. To account for gravitation, the steps increase their length, not their frequency, and it is the same when they get accelerated from a collision. I only meant that smaller particles are more massive. True, but you still do not provide an explanation for that kind of speed. In the case of a rotational motion, a tangential speed produces a motion away from the center of rotation, which has to be compensated by a motion towards that center in the case of gravitation. But I admit that it can be considered as an effect. No you did not, and you cannot either. All you can prove is that they explain the observations, which has to be the case for any useful theory. No, not stupid, just not as aware as I am about our resistance to change. I thought that knowing about it wouldn't accelerate the changes, but It seems to be doing so in my case, at least it seems to have helped me understanding your theory. I use to say that children learn what we present them because they are not stuck in their automatisms yet, but maybe the knowledge about that mechanism also helps to develop the intuitions that we already have instead of inhibiting them. An external acceleration, a collision for instance. As soon as such a collision happens, the first atom to move produces doppler effect on the light from the other atom, so it gets automatically out of sync with regard to that atom since it is the only information it receives from it. Unfortunately, once this first atom has moved, it is too late to change its mind, because the information from its motion is already traveling towards the other atom, and it will thus inevitably affect later on their common small steps. If your theory could account for resistance to change speed, then it could account for speed, but it is not the case yet. It means putting together all the small effects that particles have on other particles instead of calculating them one at a time. That's precisely what my small steps do. They are considered equivalent, but my small steps show that, in reality, they could simply be sharing the same mechanism. You probably can, but I think you will have to consider more than one principle. If you need to get speed at an increasing pace, then contraction of space is not sufficient as an information: you also have to know what to do with it. For instance you could have a detector to tell you that space has contracted a certain percentage, and another one to tell you in which direction it is contracting, but if you don't know how much you have to accelerate and in which direction, it wont help you. I had a look at wiki about metrics, and they all use tensors for calculations: it's awfully complicated. My synchronization mechanism seem less complicated: as soon as we see a difference in the observed frequency, we accelerate towards the source until there is no more difference, and we use the intensity of the observed information as a reference for the intensity of our acceleration. This way, if the difference in frequency is due to redshift, then the acceleration is constant, and if it is due to doppler effect, then it is not. It is expansion that is considered to stretch the waves, not motion. In other words, galaxies are considered at rest while space is stretching. In order to explain expansion of "space", you have to consider galaxies "at rest"; once you understand expansion, you go back to "reality" and you find out that galaxies are not really "at rest"; they "travel"; which doesn't eliminate the "motion" of expanding "space". Galaxies exceeding the speed of light is taken care by special relativity; not expansion. You have now to demonstrate it; if not by observations, at least by logical explanations. Gravity is not a distortion. Distortion is the alteration of a "shape" like a wave. Gravity is an alteration of a "metric" which is a "distance". A distance has no relations to the notion of "shape". If you change all distance of a shape proportionally, you won't change the "shape". Feel it or not. How do they do it? In what direction do they increase their length? Does increasing the length of the steps diminishes the frequency? What about its energy; does it change? These are questions you have to answer when stating the above affirmation. and it is the same when they get accelerated from a collision. You have to show and explain it not only say it. Frequency is something that I grab with difficulty. Trying to make it clear, frequency of soundwaves diminishes as the wave extends resulting from motion exclusively; without motion involved, the frequency doesn't change, which means that the wavelength doesn't change in air. But the frequency of light doesn't diminish either while wavelength extends. The frequency being the number of waves that pass a point in space during any time interval, usually one second, frequency of light doesn't change because the speed of light is an invariant whatever the wavelength. But how frequency of sound do the same? My question always was: does either the pitch or the wavelength of sound diminishes with distance. Hard to find a clear answer. We might have close on it when talking about waves on a lake that diminishes compared to waves inside the electromagnetism universe. But we didn't go far enough to get to the real explanation. The steps from the atoms are composed of the steps from their components, and these components share the same frequency. That's an affirmation. Explain it. Components of atoms are what? Electrons, neutrons and protons share the same frequency; how so? Quarks are components of protons and neutrons; they also share the same frequency; how so? I don't think that mass and size are really related unless you think that mass is a bundle of matter. What speed are you talking about? The one produced by "liberating" an object from the "grip" of the rotating Earth? That speed doesn't exist; it's the rotating speed that exists. And I've explained its origin previously. The only exact thing you say in this phrase is the "effect". Tangential speed is never produced by a rotating planet; it doesn't exists. A planet is not a "sling". In fact, instead of being "propelled" outward, each particles in contact with the ground of a planet participates in the rotation of the planet. I already explained that. So let's apply your phrase to a "sling" and correct it: "In the case of a rotational motion (performed with a sling), a tangential speed produces a motion away from the center of rotation (if we release the string attached to the object in motion "circling" and not "rotating"), which has to be compensated by a motion towards that center (not at all a motion but a string) in the case of gravitation (gravitation as nothing to do with all this). ...Which cause is the "fact" between Newton's concept and Einstein's concept? I think I proved it in the preceding post. Read this again: "We know that a satellite, in a circular orbit around the Earth, is in a “free falling” situation. And this is where we find our proof; because a satellite in free falling situation on a circular orbit, DOESN’T ACCELERATE AT ALL. It keeps a “free falling” constant speed while traveling inside its "orbital corridor". And that discredits completely the acceleration "law" stipulated by an "acting" force concept, SINCE IT DOESN'T APPLY TO BOTH "FREE FALL" SITUATIONS .". In my so called "collapsed metric situation", I have exactly the same "metric" as the metric in "flat" space; it's a "distance" of 10^-33 meter. There's no difference in the metric; the difference is in their environment. That metric is the smallest measuring "distance" that exist; it's the product of "motion" by kinetic energy. It doesn't have any relation whatsoever with "massive particles". and if you force one of them to move towards another one even if it doesn't have the space to do so, I'm sure your metric is going to know what to do. It's impossible to have a massive particle without "space" containing it. So "space" has to exist before particles exist. When particles exist, there's always a lot of space that already expended because particles don't expand. As for the "metric" it doesn't do anything; it's a "distance measure". A "distance measure" is not even a "ruler", it's just a "measure" ON the ruler. But doesn't one atom detects a Doppler effect when the other atom moves, which means "accelerate" from "stopped" to "in motion"? Why doesn't this Doppler effect doesn't put it out of sync and the other Doppler effect does? We first have to indicate the speed we're talking about. Speed is essentially a characteristic of "motion"; nothing else. The most important "motion" in the universe is its "expansion". All motions start from there. Its source is the universal kinetic energy that is an invariant. The speed of that "motion" is light speed. Whatever "slower speed" that we consider is related to the "volume" of "mass energy" in "motion" because "flowing" in "flat" space expansion or smaller "mass energy" volumes "free falling" in altered space volumes. That "mass energy" could apply to what you call "resistance to change speed"; but it doesn't really "resist"; it has, in fact, a constant speed in "flat" space, as long as the "mass energy" of the "space volume" doesn't change..
Then I guess you'll be able to help me find what I'm looking for in the next message I'll post regarding eccentricity of orbits. That's encouraging for me. If you need to get speed at an increasing pace, then contraction of space is not sufficient as an information: you also have to know what to do with it. You only have to go through it. Try jumping of a plane. For instance you could have a detector to tell you that space has contracted a certain percentage, and another one to tell you in which direction it is contracting, but if you don't know how much you have to accelerate and in which direction, it wont help you. But we already know. For instance on Earth's surface, the acceleration speed of "free falling" is 9.798 meter per square sec; for Jupiter it's 24.92 meter per square sec etc. and the direction is always toward the center of gravity. I had a look at wiki about metrics, and they all use tensors for calculations: it's awfully complicated. Only because they use "forces" concept. as soon as we see a difference in the observed frequency, we accelerate towards the source until there is no more difference, and we use the intensity of the observed information as a reference for the intensity of our acceleration. This way, if the difference in frequency is due to redshift, then the acceleration is constant, and if it is due to doppler effect, then it is not. Remind me the difference you see between Doppler effect and Redshift? I’ve said previously (to Dave) that the basic Planck’s length couldn’t be distorted. Which means you can’t stretch it like an elastic. My reason was that if you stretched it, it wouldn’t keep its Planck’s basic length uniformly or consistent. This suggestion has to have consequences that should be observable. So if there is an observable proof that we can find, let’s look for it. That proof would normally be in our solar system. We know that, in regard with Euclid’s definition of “space”, the “tissue” of space is a factual “point” (volume) to which we gave a diameter of Planck’s length (10^-33 meter) at Plank’s time (10^-45 sec after time = zero). We know that “mass energy” apply its pressure to that kind of point with the result of “altering” the whole “space tissue” (its geometry) surrounding this point (volume). The event is that by putting “pressure” on that particular basic volume, this point is stopped in its expansion to create more space (preventing to duplicate other “point volumes”). “The production of duplicated “metrics” is then blocked, and “altered space” ensues. Difference no 1: We seen the tidal effect where edges of glasses merge. The merged edge is lower than the rest of edges and the wine flows in the empty glass. 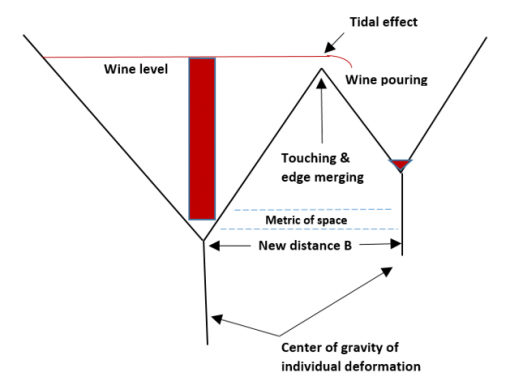 Difference no 2: We have a new shorter distance B between the centers of gravity of the glasses; the merging of edges brought the wine glass legs (center of gravities) closer to one another. That effect is the same as between the center of gravity of the sun and the center of gravity of Jupiter; both centers of gravity are displaced toward one another. And since we are comparing those wine glasses to the Sun and Jupiter, let’s pursue our analysis using those cosmic objects; the big glass will be the Sun and the small glass will be Jupiter. Naturally, it will be like looking at our glasses from the top. 1) We know that at the equator the Sun rotates in 24.47 days. So the sun is “rotating” on its axis. 2) We also know that Jupiter has more “mass energy” than all planets united. So the “space deformation” containing it, affect greatly the solar system’s space deformation. 3) Jupiter’s rotation is the fastest of all planets (a bit less than 10 hrs). Which supports our opinion for the origin of rotation. 4) The barycenter of the Jupiter/Sun system, despite the thousand fold difference in mass and due to the relatively large distance between them, lies outside the Sun itself. Officially, a barycenter is the “center of mass” of two or more bodies that are orbiting each other. In reality, the “fact” is that the barycenter is a “point in space” where the intensity of two or more “geometric deformed volumes” are in equilibrium. But this example is completely wrong. Because we have two parts of different material forming the hammer; and those two parts don’t have the same “weight” in fact, the same “mass energy”. So that designed “center of gravity” of the hammer, is really a barycenter between the wood handle center of gravity and the metal head center of gravity of the hammer. Where each sides of the center of one kind of object equilibrates themselves. This indicates a “real” center of gravity. So let us indicate the real centers of gravity of both cosmic object, the Sun and Jupiter. Let’s add the information, on the drawing, of their personal rotations on their axis which is in counter clock wise direction, just as are their orbits. A) Newton’s law impregnated an error in the concept of orbit. With Newton’s concept of gravity, there is a constant tug-of-war between the satellites tendency to move in a straight line, or momentum, and the tug of gravity pulling it back. In reality, this “tug-of-war” doesn’t exist at all. Satellites are always going “straight ahead”. The curved trajectory results from the information given by the “altered geometry” of the volume of space surrounding them. B) Each planet has a different escape velocity. The object's distance from the planet's center is also important. The escape velocity from the Earth is about 11.3 kilometers (7 miles) per second. C) Orbital velocity is the speed needed to stay in orbit. At an altitude of 242 kilometers (150 miles), this is about 17,000 miles per hour. This is just a little less than full escape velocity. And we have the speed related to that "orbital corridor" around the Earth. D) Tides (or tidal effect). The earth's rotation is counter clockwise. The moon's gravity creates a bulge on the side near it, because its gravitational pull is stronger there, and an “anti-bulge” on the far side, since its gravity there is weaker (bad explication since we saw the geometrical tidal effect with wine glasses). 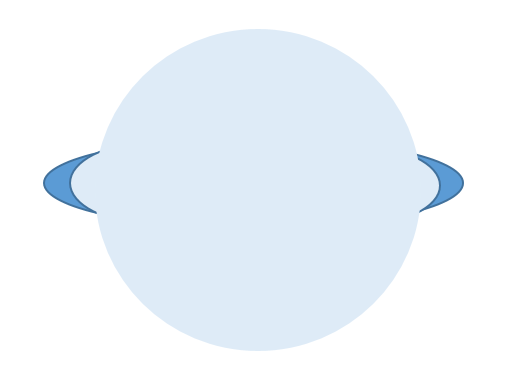 This drawing represents the orbits of both objects around their barycenter. A barycenter is the balancing point between the centers of gravity of two objects. So this barycenter has to stay in line with both centers of gravity; which, here, I voluntarily misaligned. When we correct that error, a surprising event happens when keeping that barycenter constantly between the sun and Jupiter centers of gravity. 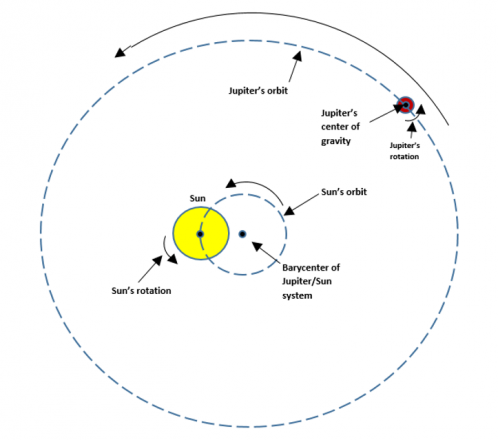 We see that the barycenter of both objects orbits around the sun just as Jupiter does. So, the reality is that the Sun is the actual center of the Jupiter/Sun system. I wonder what will happen to our way of calculating all this celestial mechanic, if this "fact" is taken in consideration? We now clearly see that the sun is the center of gravity around which Jupiter and the system’s barycenter orbit. But we also observe that Jupiter’s orbit is now “off centered” in regard to the center of gravity of the sun; which gives it an elliptic orbit. That would indicate that all elliptical orbits of planets in the solar system, could be a result of each individual planet/Sun system, because they are “off centered” by their barycenter from the Sun’s center of gravity. It would also explain why most planet have “nearly” circular orbits since “mass energy” of planets are so much lesser than the Sun’s. I agree that orbits are elliptical in shape, this means they are similar to an oval; that is an accepted “fact”; but the “reality” is that, for the planets, the orbits are almost round. Can you imagine all the questions that this observation erases in front of actual official explanations? I can find a few but certainly not all. For example: could this mean that the more a planet has “mass energy”, the more its orbit is eccentric? The fact is that the most eccentric we observe is Mercury’s orbit. Let’s check if this could be a fact? The orbital eccentricity of an astronomical object is a parameter that determines the amount by which its orbit around another body deviates from a perfect circle. A value of 0 is a circular orbit, values between 0 and 1 form an elliptical orbit. So we will note the eccentricity of each planet, and then, its “gravity” (in g) which should indicate its relative amount of “mass energy”, followed by density and mass (whatever this mass means) and give ranks to each planets subjects wise. Let’s note that a planet’s size is not necessarily proportional to its mass. In the end, how massive a planet is has more to do with its composition and density. We find here that there are none of the planets that shows an equilibrium between their “gravity” and eccentricity, density or mass. The only thing we can affirm is that the less massive planet (Mercury) has the most eccentric orbit. Which is exactly the contrary of what we are looking for. So there could be something wrong in our way of defining "mass" and its implication. Let’s add that the most massive with the more gravity (Jupiter) has the middle most eccentric orbit. The more dense (Earth) doesn’t relate to anything remarkable. So the elliptic orbit are not decided by the quantity of mass that situates the barycenter of each planets without considering the distance between the planet and the sun. But that barycenter is, anyway, the reason of elliptic orbit, demonstrated by our drawing. So I’ll have to work on it furthermore. If someone has ideas, I’m listening. You're making a mistake here, because your system's barycenter has to stay between the two bodies. As in your first drawing but after correction, the drawing should show the sun's barycenter circling the common barycenter, and then we could never imagine that this common barycenter is moving, except around the galaxy. It is only if you are on the sun's surface that you will have the feeling that the system's barycenter travels around the sun, but you can have the same feeling on the earth surface, you just have to imagine that you're the center of the universe and that everything moves around you, and the sun will be making epicycles around the system's barycenter while that barycenter will be moving around you. So, I don't think that you have demonstrated that the system's barycenter is the reason of elliptic orbit, just that sometimes, you do not put the observer at the right place.